$75 Zutano Gift Card #Giveaway (Preparing For Baby Guide) CLOSED! I love shopping for clothes for my kids. Whether its shopping for baby clothes or for toddler and kids clothes, I have fun! One place that I love shopping at for baby and toddler clothes is Zutano. They have such an amazing selection of clothes for both boys and girls and the designs are great! Recently I was sent two very cute products from Zutano for review. I love how soft these clothes are. They are made from 100% Interlock cotton, and they are made to last. The footie I was sent is like one of those outfits that I wish I had one for me, I mean it is so soft and comfortable. I could so sleep so nicely in a footie like this. 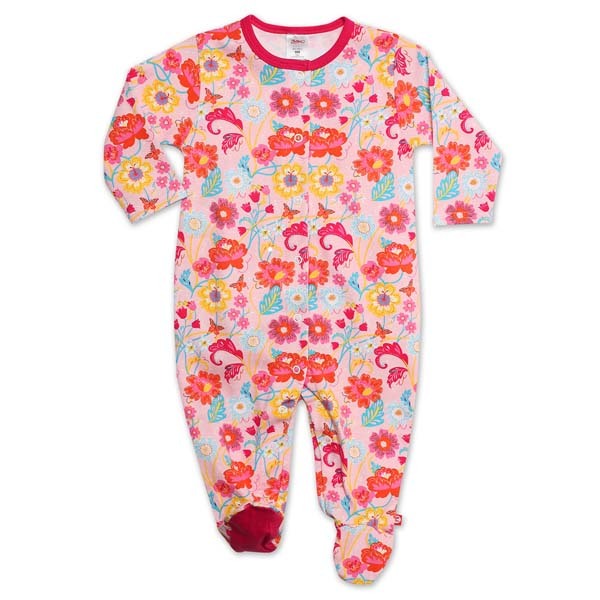 It appears to be very warm, so your little one will be very cozy all snuggled up in the footie! Then I was sent a baby cap to go with the footie. I love that with the different patterns that they have at Zutano on the different items, you can find coordinating accessories in a variety of colors. The baby hat I was sent is a very nice blue color, which not only goes with the footie I was sent, but will go with many other outfits that they have in their selection of clothing as well. I also love that the hat has a adjustable rim, so I can adjust it as my baby grows. In all, I love the clothing selection at Zutano, you can dress your little ones from newborn up into their toddler years. Well the wonderful people from Zutano would like to give one of my readers a $75 gift card!!!! Take a look at the clothes over at Zutano and tell me which item you would like to get!! Please leave me your email with this entry! This giveaway is open to US residents. This giveaway will end at 11:59 pm on April 13,2012. Winner will be chosen at random.org and will be given 48 hours before another winner will be chosen. All products for reviews and giveaways are given as a sample from the companies. All opinions in reviews I conduct are my own. I was not paid to say anything or review any products. Previous Post #Giveaway GumDrop Newborn Starter Set & GumDrop Pacifier Case with Wipes (Preparing For Baby Guide) CLOSED! Hi Katie, amazing post. Shopping for kids clothes is always fun, but your suggestions will help streamline the process. M going to bookmark your blog for future reference. Lots of great stuff going on here. I entered your Little Mommy Doll giveaway. I like the Pool Multi Stripe Baby Hat.